Weebly Ecommerce, Free Weebly Shopping Cart for Your Online Store! Ecwid seamlessly integrates with your current Weebly website so your website design in preserved and no programming is needed. Add your store to as many sites as you want and manage it from one place. Any changes you make are mirrored instantly across all your sites. Sell on websites, mobile phones, social sites and marketplaces like Google Shopping, Amazon and Shopping.com. Ecwid integrates with social networks including Facebook and Tumblr. Your Weebly shopping cart looks perfect on any smartphone and adapts to your customer’s screen. Make the most of Weebly e-commerce on your website by adding a Weebly shopping cart with Ecwid in just a few simple steps. Now that you’ve designed a sleek and attractive site for your business, you can quickly and seamlessly incorporate a Weebly online store and begin selling right away. Ecwid’s free Weebly shopping cart widget offers you a tremendous amount of comprehensive e-commerce features that you won’t find with other out of the box Weebly e-commerce functionality. Ecwid also offers you the unique ability to synchronize your Weebly store across your Facebook page, website, and mobile site, all of which are easily managed from one place. Setting up Ecwid’s revolutionary Weebly shopping cart is refreshingly simple. Once you’ve created a free Ecwid account, you’re only a few short steps away from taking advantage of Weebly e-commerce and selling your products. Best of all, Ecwid’s Weebly shopping cart is designed to display optimally on most web browsers and mobile devices by default. 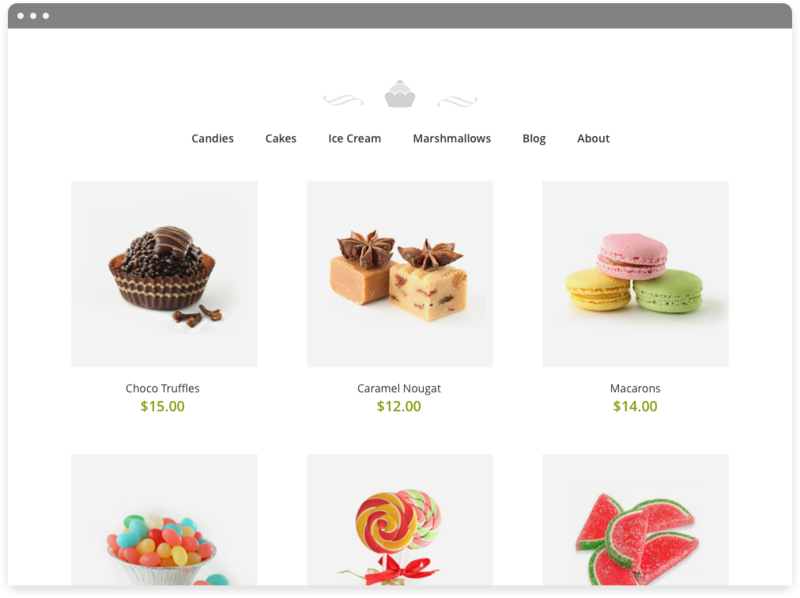 But should you wish to customize the appearance of your Weebly store, you can easily do so using CSS. You can choose from a variety of templates or create your own custom design. We’ve done all of the heavy lifting for you, so you can focus on selling your products. When you create a free Weebly shopping cart with Ecwid, you have access to a wide and rich array of features that are more advanced than existing Weebly e-commerce capabilities. Ecwid provides your store with full drag and drop support, lightning fast AJAX interface, beautiful image galleries, comprehensive inventory and data management, flexible shipping and payment solutions, customizable design layout, and advanced customer interaction options. Your Weebly store is also frequently and seamlessly updated with additional features and improvements without requiring any effort on your part. For maximum efficiency, all of your Weebly e-commerce features are easily managed on one straightforward control panel with Ecwid. Enhance and extend the Weebly e-commerce potential for your website with Ecwid’s free Weebly shopping cart. Ecwid will always offer a feature-rich Weebly store for free, though should you wish to expand your business we also offer a several paid plans that provide additional premium features with advanced support. Much faster and sleeker than the typical Weebly shopping cart, Ecwid delivers an intuitive Weebly e-commerce solution for your business that requires no setup charges or transaction fees. Make the most of your website with a revolutionary Weebly shopping cart experience from Ecwid that can be set up in a few short steps, easily managed, and smoothly integrated into your current Weebly site. Not only does Ecwid give you the right tools to easily start with Weebly ecommerce and start selling online, we also want your Weebly store to be successful. A key element of online success rests on search engine optimization (SEO). Read this free article on Weebly ecommerce SEO tips so that users can find your Weebly online store through organic search. Install Ecwid with Weebly. Learn how to install Ecwid, your new online store, into your Weebly site with step by step instructions.